As you know from this site, ballet originated from court dances that look almost nothing like the ballet technique of today. And as that dancing evolved, steps got more difficult and more balance was required for them. Eventually, dance teachers had their students hold on to the backs of chairs while learning the tough steps, and so the ballet barre was born. It’s hard to imagine ballet without it now – imagine beginner pointe in the center! So, why don’t other forms of dance have barrework? 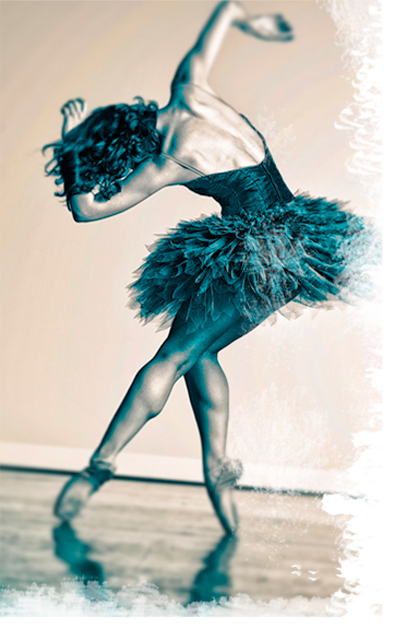 Many other forms of dance like jazz, modern, contemporary, and lyrical are actually evolutions from ballet. Jazz dancers, for example, actually do perform tendus, developpés and of course pirouettes, though these are done in parallel or with only slight turn-out. In today’s dance world, many schools simply rely on the ballet classes they provide the prepare a foundation for the students’ technique for the other forms of dance. This actually makes a lot of sense, and you can often tell when a dancer has no ballet training supporting their other techniques. Some forms of dance do use the barre for balance assistance. For example, tap dance students are often taught on the barre because of all of the work they perform standing on one leg learning tap steps and rythyms. Mastery of balance is key for dancers, and barrework can be an invaluable tool to help you with this essential skill. Barrework in ballet is wonderful from an anatomical perspective for progressively preparing the body for movement. So how can you use your time at the barre to your best advantage? You of course need to use the barre to assist in your balance. But there is a right and wrong way to do this – You don’t want to end up needing the barre in order for you to perform a step well. Remember: Barre is preparation for center! Every step performed with the barre is intended to be mastered without it. So you need to be work towards the least amount of reliance on the barre possible. And this all starts with … proper placement. From the very start of class, engage your core and work with you your best alignment and placement. Notice how your weight shifts and how your alignment might want to change with each leg extension and even with a simple rise on two legs. Feel where this should be resisted in places and allowed in others. For example, your center should shift well forward in arabesque at 90º, but barely at all in arabesque á terre. Use the barre to steady yourself while trying to master control of your placement, balance, and center. It is important that you do not use the barre to force your turn-out. Forcing your turn-out does nothing helpful for your technique, and can cause damage to your knee and ankle soft tissues. Plus, when you come off the barre for center practice, that “turnout” is gone pecan! Many dancers, especially those drawn to more modern forms of dance – begrudge the barre and can’t wait to move on to center movements. Don’t underestimate the importance of this valuable tool – it can make the difference in whether you develop the technique you need for those exciting center steps or not!